Based on a broad knowledge of traditional cuisine mostly from France, England and the Mediterranean countries, Philippe’s cooking aims to create a fulfilling, healthy, eye catching and taste bud teasing plate of food. Why not try our range of delicious savoury galettes. Homemade pancakes based on the Brittany classic. 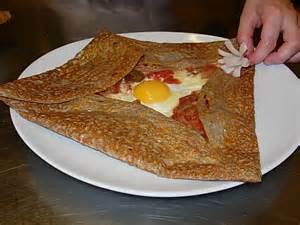 Galette Complete (ham, gruyere cheese & egg). The perfect brunch!